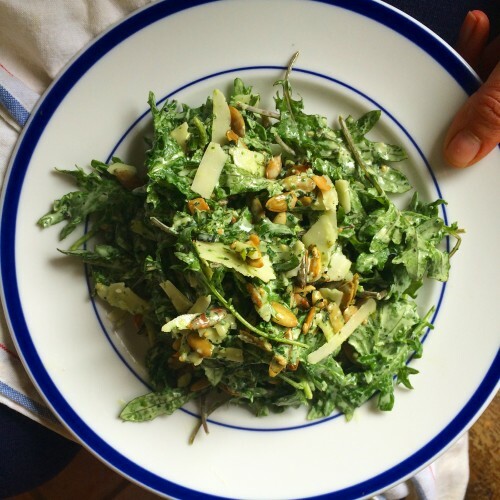 Although the winter season is typically when food magazines trumpet the making and eating of stews, soups, roasts, and other hearty, bone-warming dishes; I find that it’s the time when I’m most craving salads. Maybe it’s the lack of direct sunlight, or the fact that I never was a huge fan of stews (this could have something to do with watching too many Dinty Moore commercials as a kid in the ’80s), but lately I’ve been making winter salads non-stop. The salad pictured above, a Kale Pomegranate Concoction, is one of myÂ go-tos: Baby kale, lightly massaged with some salt and olive oil. Then topped with shaved cheddar (sue a vegetable peeler instead of a grater), avocado, toasted coconut and pumpkin seeds, pomegranate, and a simple vinaigrette of pomegranate juice-grapeseed oil-chopped shallots-maple syrup and salt and pepper. Crunchy, tangy, sweet, salty…the salad has everything going for it. 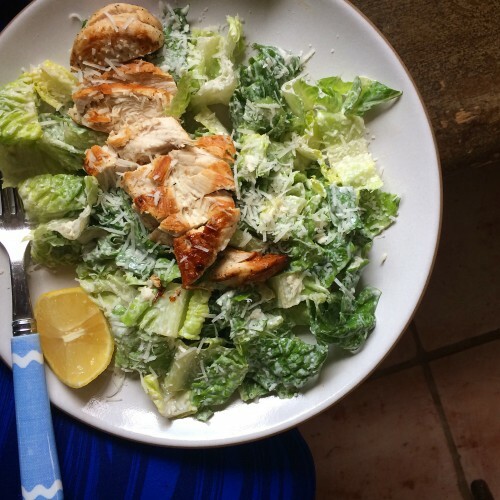 Then there’s the always classicâChicken Caesar Salad. For this, I use a version of the egg-free dressing used in the Frankie’s Spuntino Cookbook, substituting mayo for the eggs, and then whisking inÂ a few splashesÂ of worcestershire sauce, lemon juice, chopped anchovies, red wine vinegar, a minced clove of garlic, grated pecorino, and salt and pepper (if you’re using a blender to combine, adding a little bit of water is good too). Toss this with crisp romaine and add either grilled or pan-roasted chicken (or your supermarket rotisserie would do fine as well). 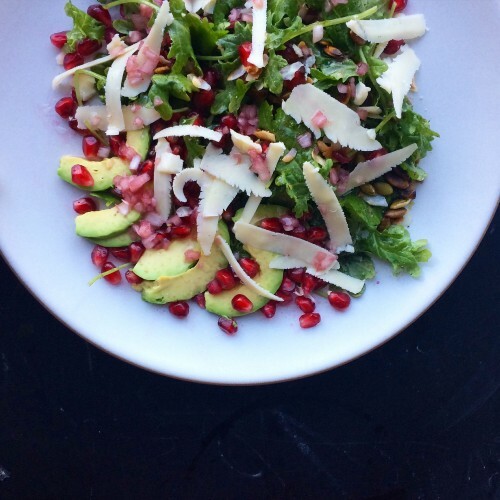 Extra grated pecorino on top andÂ I dare you to find a more satisfyingly simple salad. 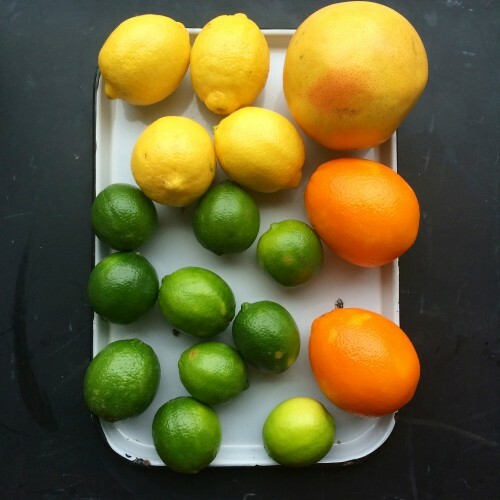 Lastly, I have become a little obsessed withÂ adding citrus to my winter salads, specifically oranges (cara cara, navel, mandarin) and grapefruit (pink and ruby red). Citrus and FennelÂ go particularly wellÂ together, lots of sharp, bright, juicy flavors all together. The only real “trick” with using citrus in a salad is removing the wedges from their pith and skin. This is called supreming and although I was a little intimidated when I first learned how to do it, I nowÂ actually really enjoy the process (“So do ou want that tangerine cut into lovely juicy wedges? Then here, HERE, give it to me! !”).Â HERE’S A LINK to a little instructional video, just remember to do it over a bowl or mixing cup that can collect all the juices that fall so that you can use them in the dressing; also a good sharp knife nice is a mustÂ tool to have, it doesn’t have to be a big chef’s knife though.Â I do something of a composed salad, layering oranges and grapefruit, thin shavings of fennel (a Benriner, which is a Japanese mandolin, is the perfect tool for the job), with the fronds chopped to sprinkle on top, perhaps a little baby arugula as well,Â and then drizzling it all with a very herby dressing (packed with so many herbs, that it’s almost the consistency and color of a pesto but without the nuts/cheese/garlic), using handfulsÂ of parsley and cilantro, and blending it some rice wine vinegar and grapeseed oil (or something fancy if I have it around like avocado or hazelnut oil), salt and pepper. Sweet, juicy, and refreshing, no matter what the temperature is outside. IfÂ your house is about to be filledÂ with a happy, hungry horde of relative-arriving to celebrate the holidays and fill you house with joy, laughter and uncomfortable nonpartisan political discussion-then you’ve probably already begun the preparations for a Thanksgiving feast. And since the interweb is presently a tsunami of turkey-day advice, tips, recipes, and admonishmentsÂ (how many brussel sprouts recipes does the world need…apparently manyÂ MANY more! ), I thought I’d share a new favorite recipe that’s not for gravy but for BREAKFAST!Â One that is perfect for serving a crowd and yet a bit more impressive than throwing down a cereal buffet. It’s a Chocolate Croissant Bread Pudding fromÂ The Violet Bakery Cookbook, which is a new and lovely to behold cookbook from Claire Ptak, who was the pastry chef at Chez Panisse and is nowÂ theÂ owner of the aforementionedÂ charming bakery in East London. I want to bakeÂ every single one ofÂ theÂ recipes, not only because they look and sound so ridiculously goodÂ âButterscotch Blondies, Lemon Drizzle Loaf, Chocolate Sunken Souffle Cakeâ but becauseÂ someone like myself (who is decidedly challenged in the egg-butter-sugar-oven department) can still make them with ease and pleasure. When I made this dish, I used day-old chocolate croissants from my local bakery, which worked wonderfully. Feel free to do the same, and perhaps enlist someone else in the house who’s there for a visit…drinking all the good wine…hogging the remote…napping on the couch with your dog and squishing up all the “good” pillows…yeah, that person…make them do it. 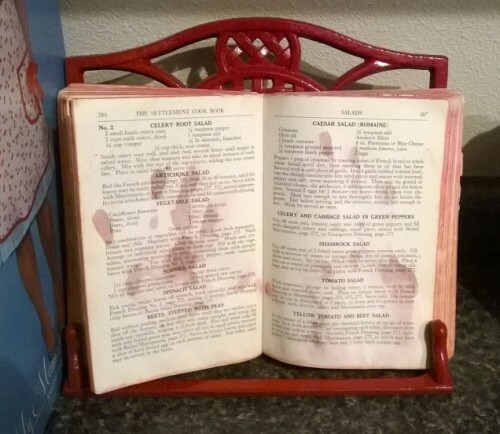 Or, maybe a better idea, your sister’s kid with a love of baking and a can-do attitude, this would be a great project for them too. And Happiest of Holidays to You and Yours! Stay sane. Have fun. And enjoy ever minute. Croissants are heavenly things when made properly. In my first ever baking job at age seventeen, I learned to make croissants at the Bovine Bakery in Point Reyes Station, California. For an entire summer I rose at 3:15 a.m. for a 4 a.m. start. Armando (the wonderful baker who trained me) and I would drink a vat of coffee and set to work sheeting the dough and carefully cutting the shapes; triangles for plain croissants and ham and cheese, rectangles for pain au chocolat and pain dâamande, and squares for apple turnovers. At Violet we lack the space for a pastry sheeter (a large machine that rolls the dough out for you in perfect sheets), so I decided not to make croissants when we first opened. A difficult decision, but the right one. You canât do everything. For a time we bought croissants in and, if any went unsold, they were transformed the next day into this luxurious pudding. Preheat the oven to 180Â°C/355Â°F (160Â°C/320Â°F convection) and butter a deep 20 by 30-cm (8 by 12-inch) baking dish. Find another baking dish that is large enough to hold your baking dish (you will be making a bain-marie later to gently cook the custard). Tear the croissants into pieces and place loosely on a baking sheet. Toast in the oven for 10 minutes, turning the pieces halfway through, until crunchy. Put the cream and milk into a large, heavy-bottomed pan. Add a pinch of salt and the seeds scraped from the vanilla pod along with the pod itself. Place over medium-low heat and just before the mixture starts to simmer, or when it starts to âshiver,â remove from the heat. Meanwhile, in a clean bowl, whisk your sugar and eggs into frothy ribbons. When the milk is ready, pour a third of it into the sugar and egg mixture, whisking constantly. Add the remaining milk and whisk in the cocoa powder. Strain the mixture into a bowl or jug. Save the vanilla pod, rinsing it well under cool water and laying it out to dry before adding it to your homemade Vanilla Extract (page 228). 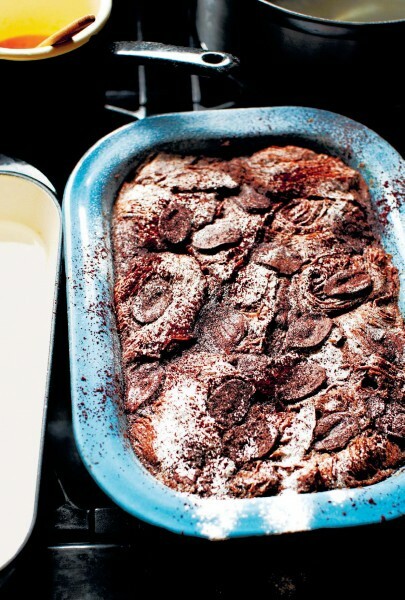 Put the toasted bread into your buttered baking dish, then pour the chocolate custard over it, so that the bread is covered in custard (you will have some custard left over), and let it soak for 30 minutes. Save the rest of the custard for later. After 30 minutes, add the remaining custard and scatter the chocolate pieces on top. Place the baking dish inside the larger dish and place in the oven. At this point, use a jug to pour water into your bain-marie so that it comes at least halfway up the side of the dish. Check the custard after 30 minutes. Bake until just set. 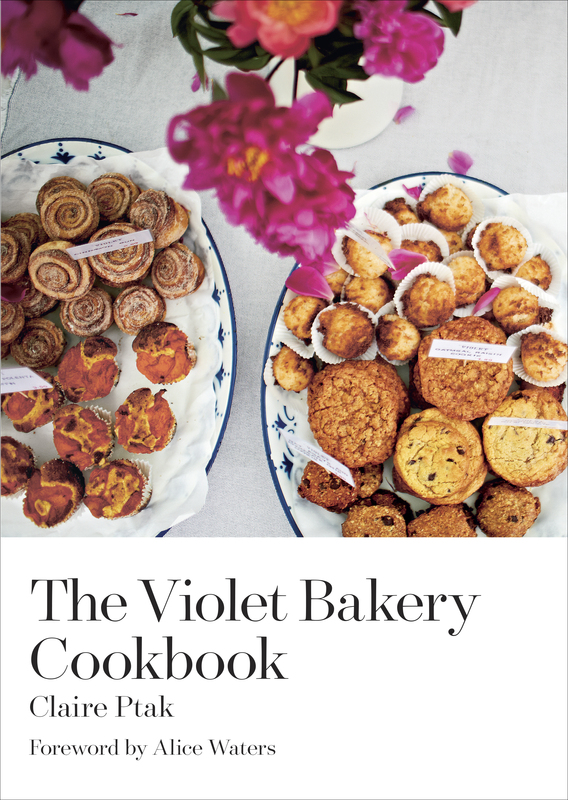 Reprinted with permission fromÂ The Violet Bakery CookbookÂ by Claire Ptak, copyright Â© 2015, published by Ten Speed Press, an imprint of Penguin Random House LLC. Food For Thought: The Hack and Writing Cookbooks! I’m in the midst of recipe testing for my second cookbookâYes, there will be a follow-up to KEEPERS! My co-author and I are writing a new book of weeknight meals (with a twist…) for Abrams Books, which is a wonderful publisher of lovely books; release date is Fall 2017 so just be patient!âwhich means that my kitchen is chockablock with ingredients, pots in need of scrubbing, olive oil-stained legal pads filled with scribbled notes, and a refrigerator jammed with Tupperware containing dishes in all states of testing-doneness. It’s a situation, but despite the chaos, I really do embrace the full-immersion of recipe developing because it’s one of the only times where I get to really think about the nature of a dish. How to make it simple, but held-together with solid technique. How to make it unique by playing with the proportions and ingredients, but not adding a layer of novelty or frills just for the sake of making it different. Thinking about what people not only want to really and truly eat after a long day, but ask what they are really and truly are capable of making after a long day. 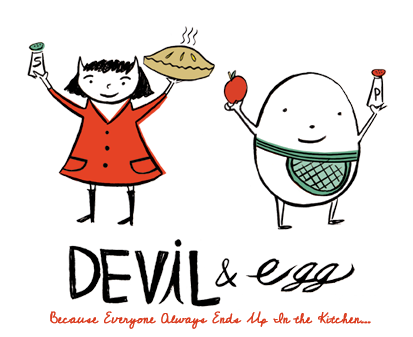 Of course, Â there’s also the added element of creating dishes that will appeal to a broad swath of people of different ages, locations, sensibilities, dietary restrictions…easy, right? Ha! 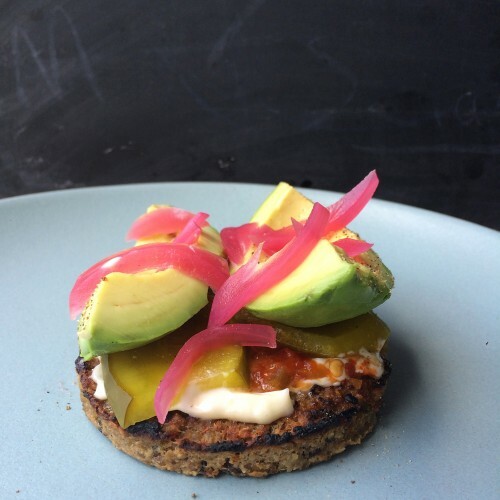 I’ve made veggie burgers from scratch, even considered coming up with my own recipe, but really, when there is one as good as the California Burger from Amy’s Kitchen (this is not in any way an endorsement…Amy and I have never met! ), then, I mean, why bother? I toast one burger in a skillet with a slick of olive or sunflower oil until warmed through, softened on the inside, and beginning to get crisp around the edges. Top with: Homemade chile-mayo (mayonnaise combined with chopped hot chile or cherry peppers, the kind in a jar that are a bit vinegar-y), pickles, red onion, and avocado wedges. Bun is optional (and perhaps not necessary because this deluxe-topped burger is pretty filling). I’ve also topped it with a generous swath of leftover pesto like the Swiss Chard Pesto from KEEPERS. The burger does the trick every timeâa cooking-hack that is incredibly satisfying and incredibly fast; the “trick” is just to top it with some fresh an homemade ingredients to make it a little more special. Â I’ve even made it for an afternoon snack when Belle has a late-in-the day activity like ballet class that starts at 6:30pm. That chunk of time between arrival from school and running off to a sport/lesson/rehearsal that I like to call (and you’ll be hearing more and more about this): The Forgotten Meal. To be a Forgotten Meal a dish must do the following: Be full of protein and good stuff to keep the energy-levels up, more satisfying than a yogurt or a handful of cheddar bunnies, better for your bod than a Hot Pocket, and a pretty good proxy for dinner. A tall order but one we will be tackling in Book Deux! So stay-tuned for more and enjoy that burger! There’s frost on the garage roof, my ratty Uggs (the ones I swore I’d never buy) are out of storage, and the neighborhood is bedecked with hearty mum-all of which means only one thing…we’re officially in full out fall! I’m not sure about you, but this also means I’m craving squash and soup, dark beer and hot toddies, apple crisp and cider donuts. Â It’s almost automatic that as soon as I pull on that first wooly sweater, I also want to eat roasted butternut squash like it’s my job. Which it kinda is. It’s also a glorious time of year because my CSA is still cranking out some amazing greens, garlic, lettuce, radishes, and beets. So I’m making the most of the late harvest by combining roasted goodies (like that squash), with rustic, hearty salads, dressed with toasted nuts, shaved cheese, and an herbal-garlicy vinaigrette. Greens: Arugula, spinach, kale; all or a mix. Nuts/Seeds: Toast walnuts, almonds, pecans (chop roughly) OR pumpkin, sunflower seeds. Cheese: Use a vegetable peeler to add strips of pecorino, parmesan, or gruyere. *Roasted Veggie: If you have some sweet potatoes, butternut squash, beets, potatoes, here’s a good time to roast them all up on a sheet pan (with olive oil, salt, pepper, maybe some rosemary or thyme) and save a few pieces for your salad. Dressing: In a blender combine 1/3 cup of yogurt, big splash of buttermilk, handful of parsley/mint/cilantro/basil (any or a combination), garlic clove, 1 tsp of apple cider or white wine vinegar, salt and pepper to taste. Whirl to combine and while motor is going add a drizzle of olive oil to give it some body. Taste for seasonings. Add a bit of honey if you want it a little sweet. Place all of your ingredients except the dressing into a large bowl (this is a good time to take out your tongs, the champion of hearty salad mixers, to get everything nicely combined). Drizzle in the dressing until everything is evenly but lightly coated.